The Boston Public Library is hardly the number one tourist attraction in Boston, but on a new map aimed at Chinese visitors, it gets top billing. Other education epicenters highly valued by the Chinese, Harvard and MIT, also make the cut, as do Chinatown and Newbury Street. 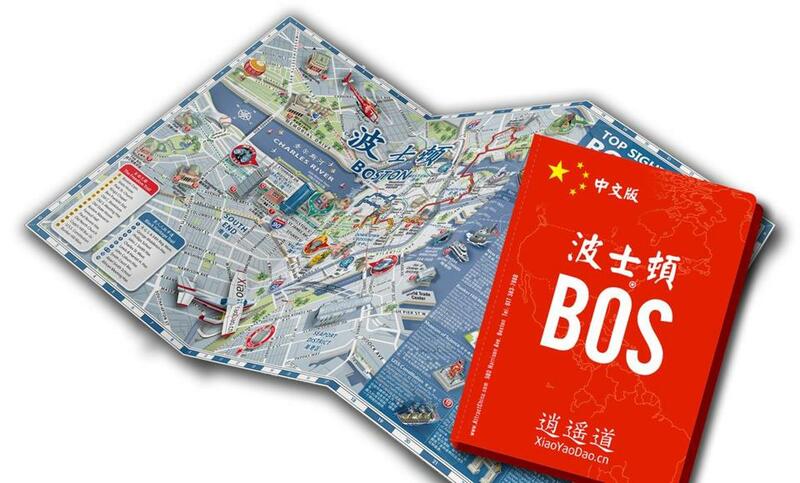 About 30,000 copies of the red, pocket-sized map are being distributed to hotels, colleges, tourist centers, and Chinatown businesses around Boston by the marketing firm Attract China in anticipation of the city’s first nonstop flight to China, launching June 20. Chinese visitors are the fastest-growing source of international tourists to the state, with 150,000 travelers spending $465 million in Massachusetts in 2012. China also sends more students to college here — 13,000 last year — than any other country does. Businesses and state tourism officials, in response, are doing more to cultivate, and better serve, visitors from China. The goal of the map is to increase the amount of time and money Chinese travelers spend in Boston, said Attract China chief executive Evan Saunders, citing a US Department of Commerce statistic showing that while Boston captures 13 percent of the US market share of Chinese tourists, it brings in less than 4 percent of the spending. That’s because tourists don’t know enough about what Boston has to offer to make them stick around, Saunders said. The staff of Attract China, which is headquartered in Boston with 20 employees in Beijing, spent a year putting the Mandarin-language map together, interviewing Chinese tourists and students, and researching posts from the Chinese social media site Weibo to find out what they liked about Boston. They found some interesting tidbits along the way. Chinese people aren’t that into baseball, which would seem to make Fenway Park an odd choice for the map’s back cover — and the number two site mentioned, Saunders said. But they love history and American pastimes. The ads surrounding the map also are tailored to Chinese tastes, down to the picture of a Smith & Wollensky lobster dish instead of a steak. Chinese visitors want lobster, not beef, when they come to New England, the firm found. In the index of top sights, the map makers purposely listed Boston landmarks that many Chinese people know, such as the library or Harvard, next to less familiar attractions, like the Institute of Contemporary Art. The map includes several directional markers pointing to attractions in other states. The Empire State Building floats in the middle of South Boston, with an arrow going south; hikers at Acadia National Park stride through Charlestown, with an arrow heading northeast. The Boston map is Attract China’s first Mandarin-language map; the company plans to publish similar Chinese guides in four other US cities this year.